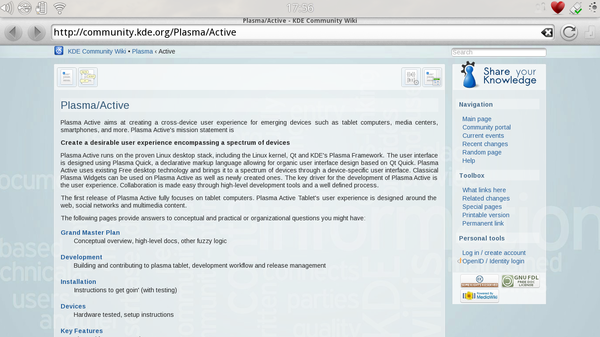 As I wrote earlier today, for all ya touchscreen geeks, now KDE offers you a touchscreen optimized desktop called Plasma Active One. 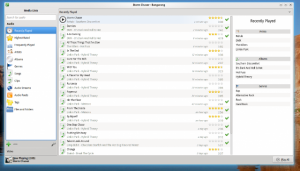 And Sebastian Kügler has posted some of the default application that you get inside this whole new desktop. Keep in mind that while it’s based on the Qt/KDE plasma desktop yet when it comes to designing a UI that’s optimized for the touchscreens, well you gotta start from the scratch, most of the time. So it’s no easy task. Anyhow, let’s see some of the apps and their “jobs”, based on Sebastian Kügler’s original post. 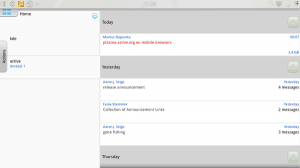 Based on the Kontact (KDE personal information manager), a new email & groupware is introduced which is called Kontact-Touch. From adding existing email accounts and forwarding them or import KAddress book contents, etc the basic features are includes. It also uses an open-source encryption to ensure the safety + since it’s redesigned … will help you to take the most out of your touch-screen as well. From opening open document formats (such as OpenOffice, Libreoffice, etC) to even reading Microsoft proprietary are supported. The core engine according Sebastian is based on the suite that’s already being used in the Nokia N9 (which uses the MeeGo platform). But it’s still in a beta stage, it seems. Many web browsers nowadays uses the Web-kit engine for rendering web pages which is known for its speed (developed by Apple if I’m not mistaken, Google Chrome heavily uses that). The one that comes with the Active One also uses Webkit + kdewebkit front-end… so I’m assuming that it’s also based one the Konqurer browser, perhaps. Anyhow, this is also a touch screen optimized browser (you know big buttons, etc) which is supposed to let you browse your web through your fingers 🙂 (enhanced HTML5, CSS, etc). "Banga what! ... rang rang :D"
Bangerang is a multimedia player that supports Gstreamer or the recently introduced KDEs’ own multimedia framework called the Phonon. 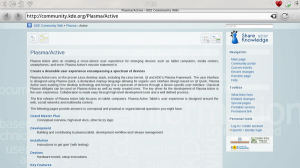 The Plasma Active One also comes with a slightly modified version of the player. 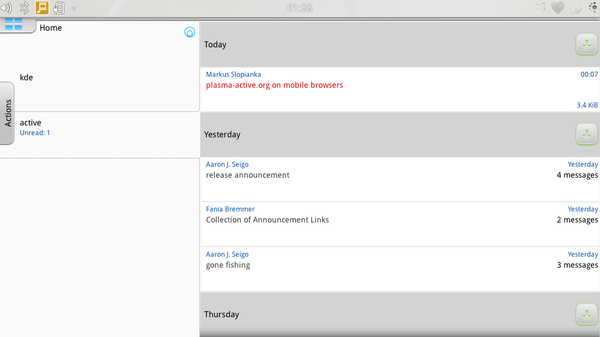 “I also disabled drag and drop in the Media Lists view when touch is enabled since it’s likely to be running fullscreen. Note that this is not all QMLified and fully optimized for touch (including swipe scrolling and all that)… yet. Like I said, I’m mostly hoping to get it tolerable first. Yikes! :D. You can read more from this developer’s blog post concerning this specific subject. But his post is like 2-3 weeks old thus I think the core developers of the Plasma Desktop One has done their fair share of customizations nonetheless. And specially with touch screen based desktop modules it’s essential to let third party application developers to have a go with ease which is also possible (for both open-source and proprietary ones), it seems. So as a final word, creating a touch sensitive UI is no easy task but although I haven’t used it (how could I, don’t have those “touchy” things) but after looking at some of the videos and pictures… the desktop looks absolutely beautiful, so although my words means almost nothing. But anyone who contributed, well done!. But one last question remains however, this is the Qt/KDEs’ answer to touch-screen based “market” … what would the Gnome dudes do? ?